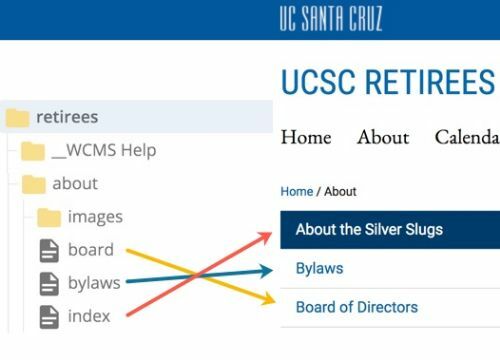 Managing your site's left navigation menu may be different than how you have done this with previous sites or in other applications. All left navigation menus are dynamically created by the Campus WCMS. The WCMS "reads" all the files in a folder and indexes them to appear in the left navigation. After adding or deleting a file in a folder, for the dynamically created left navigation menus to appear correctly on your website you must re-publish the parent, grand-parent, etc. folders so that WCMS can read and properly re-index the items that appear in the left navigation. You need an understanding of folder management as a basis for these tasks. Remember, folders and pages that are 'indexed' become visible as a part of the left navigation menu. To be visible, the main folder must contain an index page. *NOTE: The Display Name for an index page displays the folder's display name.